My alarm wakes me at 7:30 and, at first, the light emanating from the curtains looks dull. However, it turns out that this is just the shadow of the narrow street in front and, by sticking my head out the window, I can see a clear blue sky in either direction. 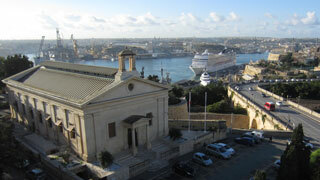 I'm on the roof terrace for a breakfast buffer at 8:00, enjoying a panoramic view of the Grand Harbour as an enormous cruise liner pulls in to port and, astonishingly, completes a three-point turn in the narrowest of spaces. Checkout is at 11:00, but I'll have to leave ahead of that in order to catch my flight back to London at 12:30. So, at 8:30, I give myself just under two hours to continue exploring Valletta on this beautiful morning before I must return to Hotel Castille to check out. I venture back down to the docks to catch another glimpse of HMS Illustrious, which is now dwarfed by the cruise liner alongside it. As I stand there in awe of the aircraft carrier, some soldiers at the top of the landing ramp play an awful screeching tune on their flutes. This apparently signals the disembarkation of the captain, who descends right in front of me and jumps in to a waiting Range Rover. Continuing along the southern edge of Valletta, I pass through the impressive Victoria Gate, named after Queen Victoria who was the reigning sovereign when it was built in 1885, and on towards the giant Siege Bell that I saw yesterday. Despite the earlier clear skies, the weather remains unpredictable and I once again find myself in a sudden downpour, rushing towards the centre of town in search of shelter. As the rain eases, I carry on through town to the northern edge of the peninsula. It's only a fifteen minute walk from one side of town to the other. 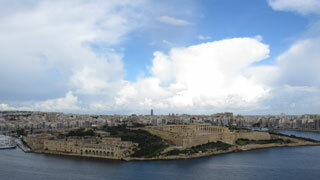 Having left behind the Grand Harbour to the south, I am rewarded with equally great views of Marsamxett Harbour to the north. From here, I can see the entire shoreline that we round around yesterday. It's just past 10:00 though and I must make haste back to the hotel. I check out at 10:20 and head straight to the bus stop to catch the express bus out to the airport. Malta Airport only has one terminal, thus avoiding any repeat of the Gatwick check-in debacle that we experienced three days ago. I'm in plenty of time for my flight and grab a drink before departure. EasyJet have introduced allocated seating since Saturday and, although I've been assigned an aisle seat, I'm in luck as most of my fellow passengers seem keen to trade their window seats. On the flight back, I'm treated to spectacular views of the south coast of France and of the alpine ski resorts. The flight is on time and I'm back home with my giant bag by 16:15.